I have really slacked on our "A week in the life of homeschoolers" posts the last three weeks due to being too busy or too tired. So here is what we have been up too. We are currently down to one car right so if the kids and I don't absolutely need the car Ben takes it and we are pretty much stranded at home for the day. But we have still been finding fun adventures to take. Like who would have thought that a volleyball pit could be so much fun? We had a lot of fun watching our beans continue to grow. And we finally got around to creating our "nature board". This is a special board where the kids can glue all their nature treasures. So far it is filled with moss, a paper wasp hive, feathers, flowers and leaves. But the highlight of our week was attending the GHEA Conference. Both kids attended the conference with me on Friday and Saturday because they were just begging me to take them to a conference. We had lots of fun! 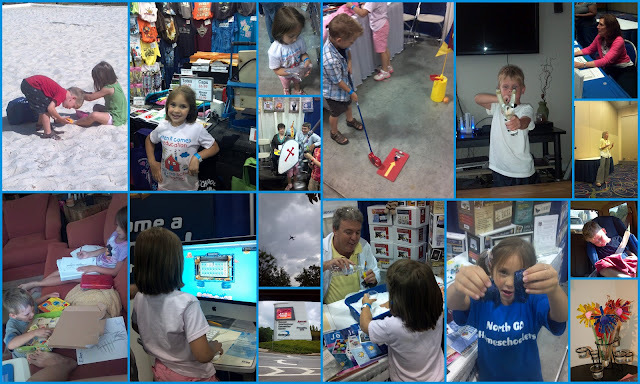 We sat in a few workshops, made a few friends, talked to lots of vendors and got lots of fun freebies. The GHEA Conference is held right next to the Atlanta Airport so all day there are huge airplanes flying overhead. The kids found this absolutely AMAZING. Sunday we did a fun craft using toilet paper tubes. This week we started our bat unit. We have ALL had (yup including me) lots of fun learning about bats. We started our unit with a fun batty breakfast. Then we started reading our books on bats, hung upside down like bats, made a bat cave and even made some bat wings. We also decided it was time to dissect our beans. The kids were amazed by how much they grew. Gwyn mentioned how it was just like Jack and the Bean Stalk. And we finally got to take some field trips, YAY! Boy a week off was way to long. Wednesday we used our coupons for Monkey Joes which was a great rainy day activity. The kids had lots of fun bouncing and even made some friends. Thursday we had our Back to the Roots presentation which was lots of fun. Each family that attended received their very own kit and bag of soil. Friday Ben was off work again because of working an on call shift all week so we squeezed in another field trip. We went to Oakland Cemetery/Garden. 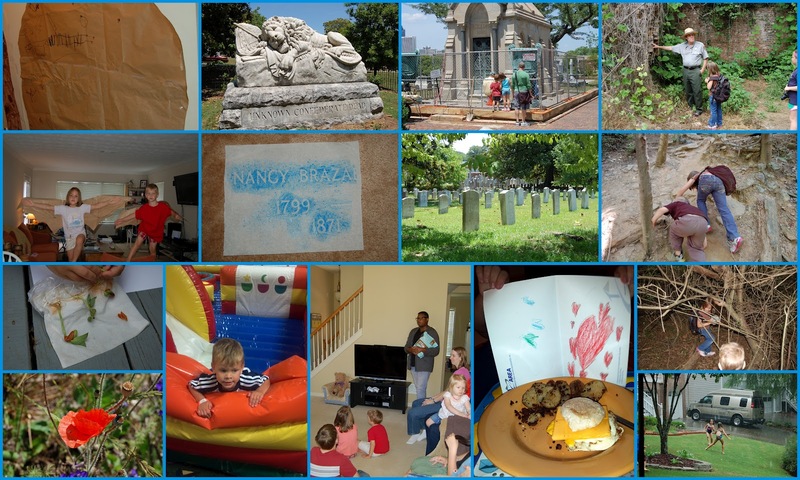 Who would have thought that visiting a cemetery could be so much fun and so educational. We got to see where Margaret Mitchell, Maynard Jackson and lots of Confederate soldiers are buried. We did some tombstone rubbings and tried (but failed) to find a geocache. We also saw some beautiful wildflowers and got to do some bird watching. The kids also learned about tomb restoration. When we got home Gwyn worked on one of her lapbooks while Rowyn worked on a new Kindergarten curriculum from Currclick. We also have been watching two of our new favorite DVD curriculum's "Have Fun Teaching Alphabet Songs" and "Essentials in Writing". Saturday Gwyn had her last soccer game. She was super excited that her Grandma, Grandpa, Aunt and Uncle could come watch her. She was even more excited that she got to play in the rain. After the soccer game the sun finally decided to come out so we headed to our new special spot in Roswell for a tour. We also did some geocaching and found 2! Gwyn really loves the crown charm treasure that she got out of one of the caches. Sunday as you all know was Mothers Day. I received a special card and breakfast in bed. Then we went to a family cookout at my brothers. It was pouring rain and Gwyn was so bummed that we wouldn't be able to go to the pool as planned. So....the kids decided to play in the rain. Gwyn, Rowyn and 2 of their cousins had a blast. Monday we started our lesson on The Titanic. We read lots of books and worked on our lapbook. Wow learning about the Titanic is sad I had a hard time reading some of the books to the kids. Tuesday we had speech class followed by a few errands. Wednesday we used our FREE tickets to Imagine It which is Atlanta's Children's Discovery Museum. The kids had fun but it is probably not a place we will visit again. It was very small and there wasn't much for them to do (definitely not worth actually paying full price for). Afterwards though we had a great time at Centennial Olympic Park. We ate lunch in the park, did some bird watching and played on the playground. If you ever visit Atlanta you must visit the park. Thursday we participated in the online Bats Live webinar. It was wonderful and very educational. They showed real live bats which both kids thought was very cool. And they answered the questions that kids emailed into them. 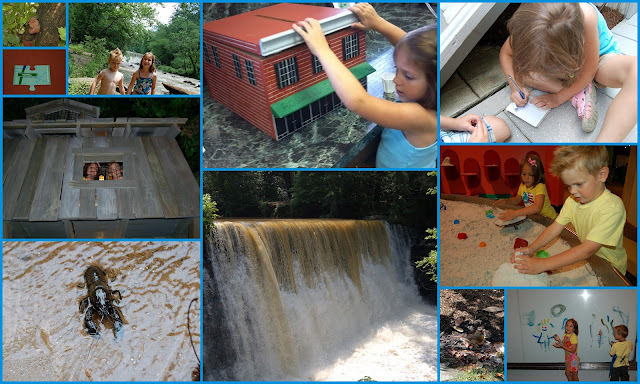 Friday we went to our favorite spot with the homeschool group...Roswell Mill again. But before we met the group we went to the Roswell Visitors Center to get our first puzzle piece to the Hospitality Highway Geocache. We had a great time sharing our special spot with the group and I tried my best to point inform them of the history and also the flora. We had lunch at the picnic tables then afterwards my two played in the river. We saw a really cool crayfish and played with him for a little bit. And we completed 2 Geocache challenges. After we left the Mill we headed over to the downtown square to try to find another Geocache. We never have much luck with the micro caches but today we did. Gwyn was really excited she even wrote our Geocaching name on the log. So that is what we have been up to the past three weeks. Hopefully I will be better about getting next week up. Your documentation is impeccable, Kathy... I admire your persistence and seeking out wonderful opportunities for the kids!! Enjoy your weekend! GREAT POSTS.. When they are little the hands on stuff is so great. Enjoy reading your post. you are amazing! What fun !!! Would you schedule a week of homeschool for us? !